This article is about the enemy from Donkey Kong Country 2: Diddy's Kong Quest. For the cannon from the same game, see Kannon (cannon). 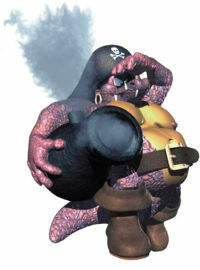 Kannons are large cannon-wielding members of the Kremling Krew; they only appear in the games Donkey Kong Country 2: Diddy's Kong Quest and Donkey Kong Land 2. Kannons attack by shooting barrels or kannonballs at the Kongs in whatever direction they're facing, either forward or downward. Kannons can be found in several levels, but mostly underground areas. Despite being large and burly, Kannons can be defeated by any attack method. According to the instruction booklet, Kannons are simply Klumps trained to use such weapons. However, while normal Klumps wear army gear (green helmet, grenade belt, etc.) Kannons wear more of a pirate ensemble, such as earrings, a large belt, and a large black hat with a skull and cross-bones on it. Also, Kannons seem to have distinct ears. Kannon appear in the following levels. According to the game's credits, Kannons belong to the "Kremling Kuthroats" enemy class. Kaptain Skurvy, a character from the Donkey Kong Country animated series resembles a Kannon. The only obvious difference is that Skurvy has a hand-cannon instead of a cannon, but it's still large enough to fire small cannonballs. Kannon was named "Klumpa" in earlier builds of Donkey Kong Country 2. ↑ Donkey Kong Country 2: Diddy's Kong Quest Instruction Booklet, Nintendo, 1995, p. 29, SNS-ADNE-USA. "It looks like Klump can shoot!" This page was last edited on March 16, 2019, at 21:54.